So What’s the Best Level of Language to Use?, You May Ask. What’s the best level of language to use? It depends on your purpose. If you want people to trust you, use Level I. If you want people to think you’re oh-so-intelligent, use Level II. If you require absolute precision in specialist occupations, use Level III words. If you want to offend someone, use the Basement. And if you’re after just exactly the right word to create a sense impression, go up to the Attic for those poetic words. An interesting case study is the difference in levels between the rhetoric used by Presidents Bill Clinton and George W. Bush. Bill Clinton is widely acknowledged, even by his enemies, to be an extraordinarily intelligent man, as can be seen by his early career as a Rhodes scholar and lawyer, and his masterful public speaking. He has all the mental equipment necessary to speak and write using Greek- and Latin-derived words. Strangely enough, however, when he is speaking, he uses mostly Level I (that is, German-derived) “home” words. 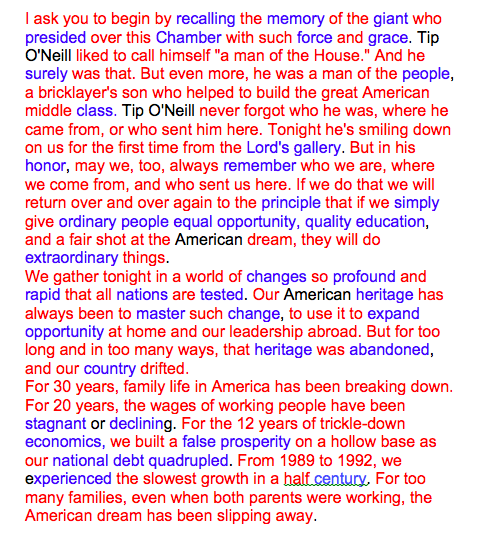 Here is a color-coded transcript of a State of the Union address he gave in 1994. Level I words are coded in red (for “home fires,” as in “keep the home fires burning”) and Level II words are coded in cool, intellectual blue. The red words are Germanic in origin. The blue ones are French. We can notice first of all that Bill Clinton uses primarily German-origin words, simple words that everyone understands. Most of his verbs are the fine old Anglo-Saxon verbs that everyone knows and uses from childhood, “begin, give, come, send, do.” He uses phrasal verbs such as “break down” and “trickle down” and “slip away.” His nouns are mostly French words that have been in the language for nearly 1,000 years, since William the Conqueror brought French to Britain in 1066, but they are subtly more precise and formal, letting us know that he has the exact words to describe complex phenomena when he needs to do it: “economics, opportunity, prosperity, quadruple.” But he doesn’t overdo it. Most of his speech is home language: reassuring, simple, and direct. Tomorrow we’ll see the contrast with the following president, George W. Bush. Stay tuned! I really like the analysis–interesting all around. And helpful to remind the reader what each color denotes (every time–we don’t have each separate post in front of us as a guide It might feel repetitive to you, but helpful to us–simple reminders, because we be simple people :-). Noted. I’ll explain the system every time.